What will you or your family do if the tap is dry and the well won't pump? Water is our #1 dependency-you have to have it or your body will begin to close down in only 24 hours. Get prepared now while there is time. Use now for tap water (costs 1 cent per gallon to use) and in an emergency provide pure, safe water from a creek, a pond, rain barrel, toilet tank or you name it. There is an AquaRain filter just right for you and your family size--small, medium or large. Buy the best quality seeds for your summer garden! These are the seeds investors purchase for the long haul. 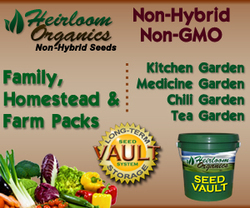 Heirloom-Organics is the largest provider/grower of heirloom organic seeds in North America and that is all they produce! Most importantly, they are the ONLY long term seed provider using the VAULT method of saving seeds for the long term. Why risk losing viability when you had counted on it for your family's future? All seed vaults are sold at wholesale pricing. Click above to see the many selections of seed packs available. Don't put this off another day--your life could depend on it. You can buy from us because we are a select distributor, our pricing is the same as the company's.